Players will improve ball handling, dribbling, passing and receiving. Groups of players are sent to each box at the corners of the playing grid. Players are told to do specific skills while in boxes. 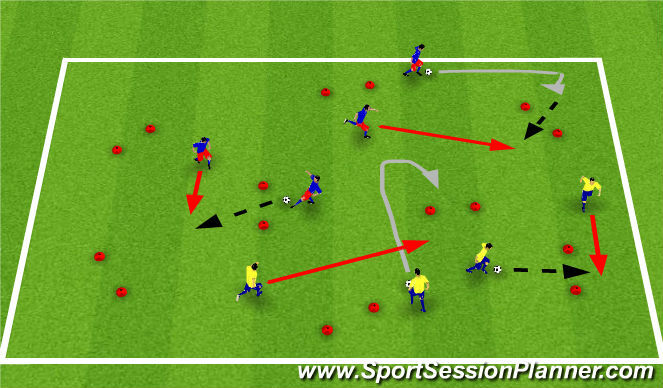 First start with dribbling in tight spaces, then on coach&apos;s command, dribble to next box. Then do other skills in boxes e.g. tip-taps, bells, scissors, sole rolls, etc. 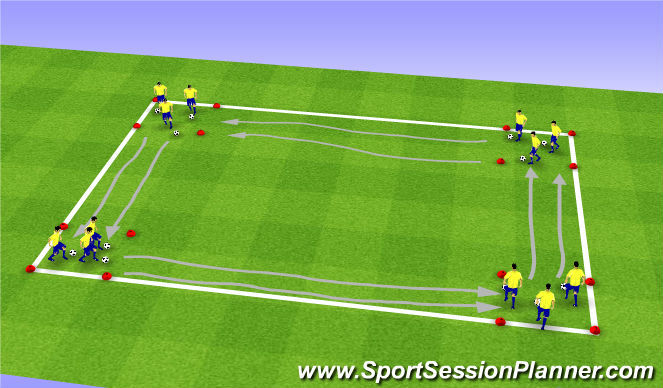 After each 30 second box activity, players dribble their ball into the next box. Use less dominant foot when dribbling to box, and use word like "switch" to go in opposite direction and "next" for forward dribbling. They can also dribble across with word use "across" or "opposite" to add dribbling into pressure. Organization: Full gym. 16 cones set up in pairs as gates, at different angles. Players set up in pairs with one ball to each pair. 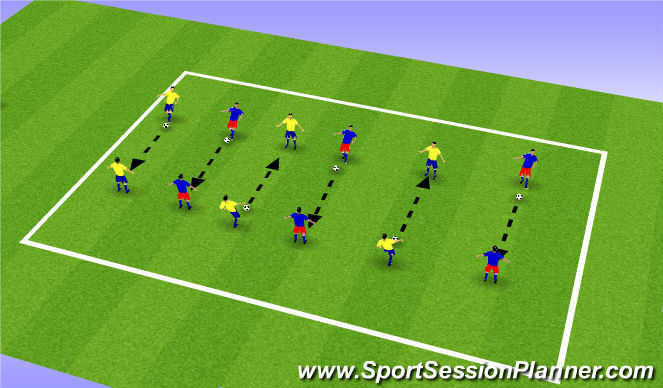 Instructions: Players work in pairs, dribbling to a gate, and then passing through gate to supporting player. Players must pass through all gates in 2 minutes and count how many gates they&apos;ve passed through successfully. Then players repeat the drill for another 2 minutes and count successfull passes. Good turns with ball using inside and outside of foot. Ball under control at all times and try not to stop ball before making passes. Support players should receive ball with body opened up in direction of run. Quick turns to another gate if other team is closer to a gate. Supporting players should call for ball and use visual cues to ask for ball. Defenders to block gate so pass can&apos;t be made forcing teams to use other gates. Instructions: Players work in pairs, standing across from one another. Players will pass to receiving player. Receiving player will stop ball and get it under control before making pass back to team mate. Players will stand 5 meters apart, then increase distance every 2 minutes. Pass with inside of foot. Receiving players always on balls of feet. Free play, small sided games. Use neutral wingers on each side. Wingers can only play a 4 touch maximum including a pass in. Neutral players work with both teams and always attacking. Change neutral players and goalies often. Give players maximum number of touches if too much dribbling is happening. Play retreat line at half.